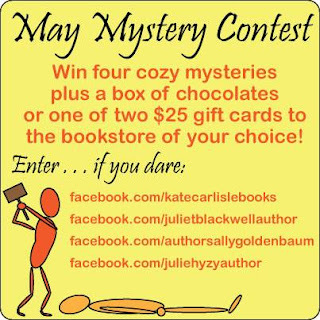 I've teamed up with three other cozy authors and we're offering you a chance to solve a puzzle to win books and chocolate or one of two $25 gift certificates to a bookstore of your choice. But don't delay, the contest ends tonight! Simply visit my author page, HERE, and click on the "May Contest" tab up at the top on the far right. All the rules for entering are there. 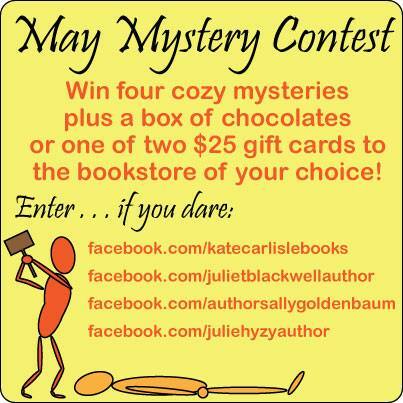 Kate Carlisle, Sally Goldenbaum, Juliet Blackwell and I are hoping you enjoy this fun chance to win. And maybe even find a new author or two in the process. Today is your last day to enter, so don't wait! Thanks y'all. What a great giveaway! I entered and I loved the contest! It was a hoot figuring it out! Plus, I found a couple new authors to enjoy. Always a great side benefit!